QUETTA: The 2016 Expanded Edition of “Aboard the Democracy Train, Pakistan Tracks the Threat Within” was launched on July 21 at Quetta Press Club Quetta. Speakers at the book launching ceremony said it was preplanned to distort the essence of democracy in the country, which is why the people showed aversion to democracy and politics. Through infiltration in ethnic, religious and political groups ‘ideological politics’ in Pakistan was distorted, as result of it democracy failed to develop in the country, they said. 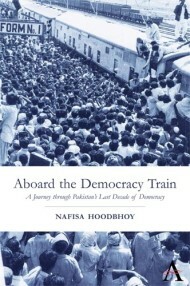 Nafisa Hoodbhoy said that in the present expanded addition she included the latest events especially related to terrorism, including Peshawar Army Public School carnage and China-Pakistan Economic Corridor (CPEC). Veteran Journalist Siddiq Baloch said the people have been befooled in the name of CPEC, which, according to him, was being used as a propaganda tool. Former Balochistan Chief Secretary Hakim Baloch said that with the help of Muslims’ votes Pakistan was democratically created. Despite it, the people’s representation was not respected following the creation of Pakistan. As a result, he said, politics, politicians and democracy all have become victims of terrorism. Former Finance Secretary Mahfooz Ali Khan said the people of Gwadar are deprived of their basic amenities, especially water. With the CPEC, the government should also resolve the issues of the people of Gwadar. “Although CPEC is being introduced as a game change, it is in reality not so. Instead, it is only being highlighted to divert the people’s attention from the sinking economy,” said Siddiq Baluch. He also regretted that out of 1600 only 400 megawatt electricity is being given to the people of Balochistan, which is injustice with the people of Balochistan. Besides it, he said, gas was discovered in Balochistan in 1952, and to this day 29 districts of Balochistan are still deprived of it. “Balochistan makes half of Pakistan, and if Balochistan remains backward is meant that half of Pakistan is backward,” said Siddiq Baloch. Lauding the author, Mr. Badini said the author has wonderfully and meticulously brought to fore the issues of all provinces of Pakistan in her book, and for the first time in Balochistan an author has come out of the province to launch the book here.